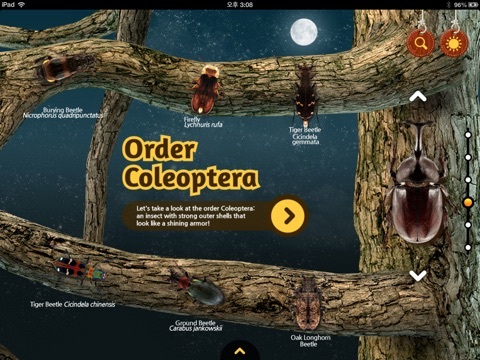 Meet the Insects: Forest Edition is the first app in a planned series of insect encyclopedias. All information in the app is provided by the National Science Museum of Korea. This science app provides an excellent method for learning about crawling and flying insects; such as various beetles, stink bugs, butterflies and months. Beautiful photos and up-close videos bring the insects to life; along with easy to learn facts all presented in nice learning environment. Not a fan of learning about insects? This beautiful, high quality app is great for kids wanting or needing to learn about insects in a fun, educational and interactive way. 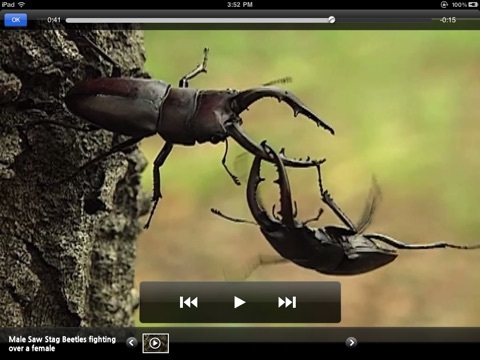 Meet the Insects: Forest Edition is the first app in a planned series of insect encyclopedias. All information in the app is provided by the National Science Museum of Korea. This science app provides an excellent method for learning about crawling and flying insects; such as various beetles, stink bugs, butterflies and months. Beautiful photos and up-close videos bring the insects to life; along with easy to learn facts all presented in nice learning environment. 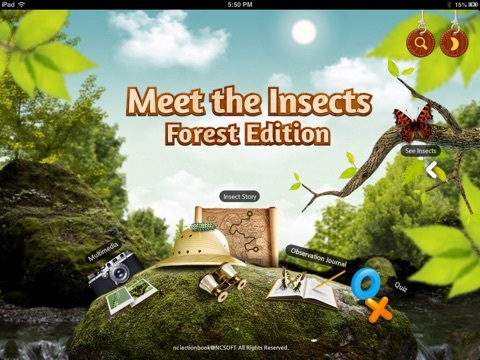 Meet the Insects: Forest Edition is an excellent app for at home or school. There are numerous ways to use the app for learning; search or scroll through the insect facts, photos and videos or journal about your observations. No internet connection required to view any of the content. All content is contained within the app. Two fun quiz options are available for testing your knowledge; quiz by facts or photos. Writing in the observation journal and adding photos is easy to do. I like that multiple entries can be made for the same day. This is a very nice feature and it is well designed. There definitely needs to be more science apps in the app store, especially for kids ages 8 and up. This app nicely meets that description. It’s also a great way to study insects without having to touch them, or in some cases smell them! The app does not require a lot of reading and what reading there is has been formatted to make it easy to read, as far as text size, color and location on the page. Not all text is narrated, adding this feature would be ideal for beginning readers or those that struggle with reading. Meet the Insects nicely combines facts, multimedia and some interactivity to keep users interested. Additional insects and facts will need to be added to give this app staying power; hopefully, it will be done as free upgrades due to the initial cost of the app. Insect story is a presentation of what insects are, the life cycle of insects, insects and their dazzling colors and diverse patterns and more. The presentation is just the right length and speed, adding pause and replay buttons would be beneficial for parents or teachers, allowing them to pause it for discussion or questions. 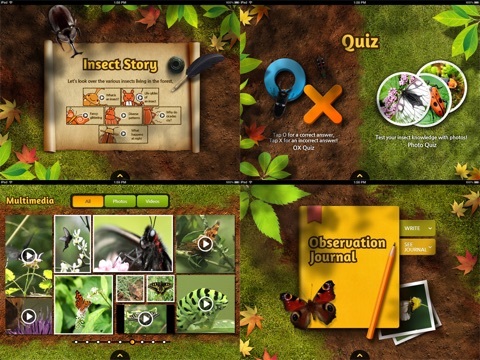 If your kids love learning about nature in general, and insects in particular, they will enjoy using this science app. Fun facts, quality content, and a media gallery which includes videos makes this educational app entertaining too. 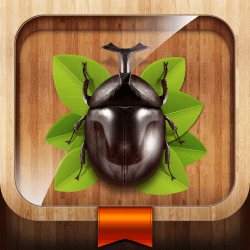 Meet the Insects: Forest Edition is an excellent quality app with a good amount of content to get your child started. Photos, short videos and brief facts are available for most of the insects, with more promised in future updates. A bit more information for the existing insects would be nice. Design is easy for kids to use; they can easily navigate and use the app. Not all text is narrated so users will need to be proficient readers or have someone available to read to them. Meet the Insects is a child-safe app; it does not contain any links or buttons for in-app purchases, social media, etc.